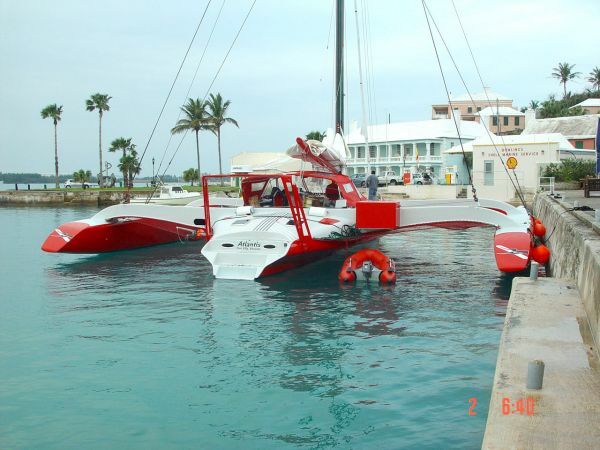 63′ trimaran in composite materials. 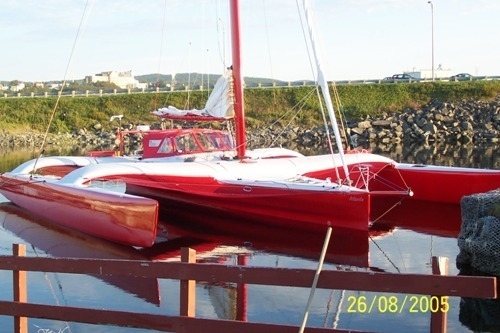 This 63′ trimaran is a smaller version of the 72′ tri. Like the 72, it offers the interior feel of a big bridgedeck cat with superior upwind sailing performance and better maneuverability. Construction is foam/glass with an option for carbon fiber beams. 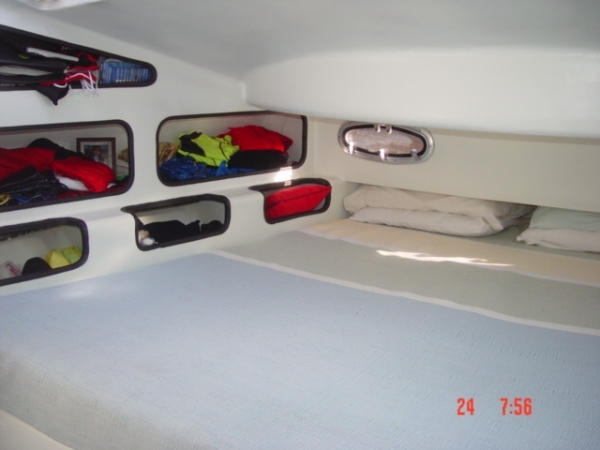 The interior arrangements are classical trimaran style, with staterooms on the “wings” and an owner’s stateroom aft with an office and nav station. 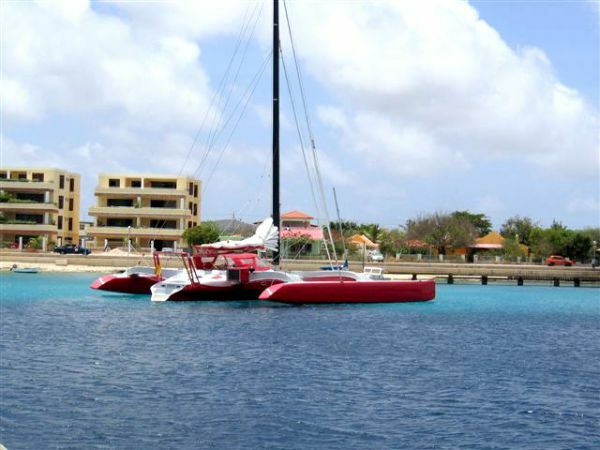 I’ve been obsessed with catamaran and trimaran designs lately, and came across your website after reading about cat2fold. I have really enjoyed thumbing through your designs. 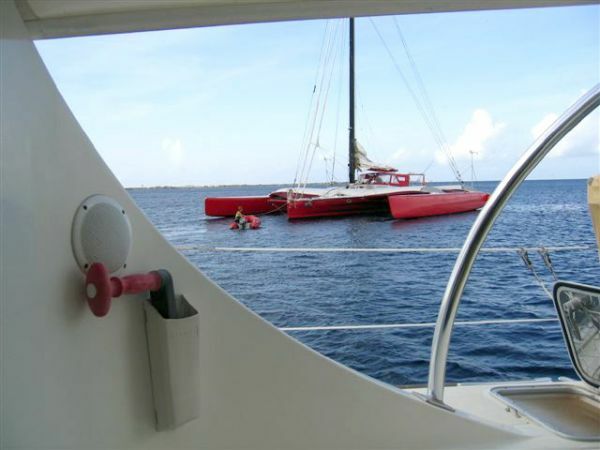 I especially like the trimaran with sliding amas, and the huge red trimaran. And cat2fold’s folding system is very cool. Thanks for sharing all of this. Are the photos and the drawings, sail plan and specs fall within the definition study plans $ 50. If not how more substantial are study plans. typical study plans are all the views, in and out, plus sections. And materials list, deck hardware and story. Will post as soon as made into gif. [ Bare boat, including engine, propulsion, mast, winches sails, anchor and chain, sheets, water and fuel tanks but empty, radios, electronics instruments, gen set. life raft, safety equipment ] ? I call weight complete vessel, empty and dry. I can’t think of anyt other definition. Whats does a complete vessel empty and dry mean? There has been a lot of complaints on world websites by posters prospectus buyers that they can’t get strait answers from designers and they all have different definitions. Some say it is done on purpose so if the boat does not float to design lines they have some degree to scrurm explanations and exonerate themselves. I have no idea what other designers do. I thought I gave a “strait” answer on this already. Complete, empty and dry. I’ll add my question and your answer to the forum debate re your interpretation with your name. It could be that some people don’t want to get out the chain catalog, find the weight of chain per foot and do their own homework. Weight of rigging…get out the wire rope catalog, weight of wire rope per foot. Got a calculator? Anchors, engines, winches… your choice…go to their sales catalog…the weight will be in the catalog. This guy Kurt has already designed this superb vessel. What more do you want from him? This is not unreasonable. I have spent hours finding out the weight of shackles, hook blocks, crane jibs, weight of wire rope etc. for my job on construction cranes. The person choosing the rigging, sails, engine and other variables should take the responsibility to know his boat. Read about this not long ago. Quite a project to build on spec but they had to keep the eepmoyle’s busy during the downturn. Makes good business sense and it’s ready to go when a buyer fronts. It could be the next True North world tourer, just sign on the dotted line Mark !!! Complete — with all the bits attached that need to be. Empty — no extra equipment, tools, kit or luggage. Dry — empty fuel & water tanks. Come on, Waterbird! I’m no mechanic or builder, but that’s so obvious.